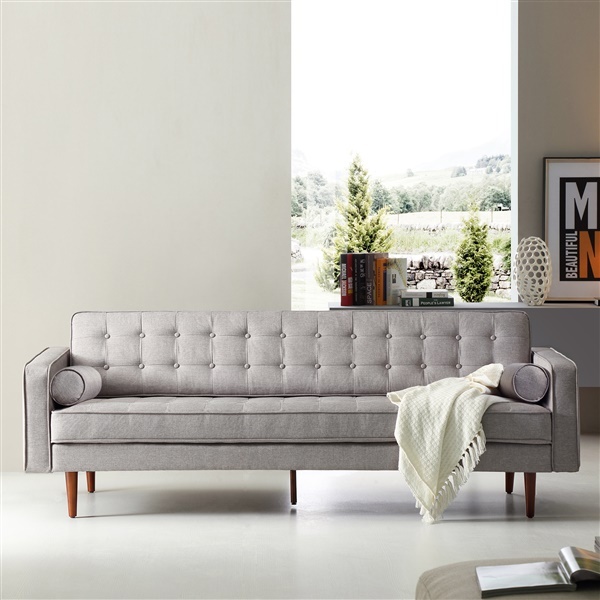 From its clean lines, classic tufting, and tightly-woven retro-chic microtweed upholstery, the Flo Sofa delivers an authentic mid-century aesthetic and feel. Sitting atop its 1950s inspired walnut finished wood legs is a generously accommodating single seat cushion that spans from arm to arm, and topped with two round bolster cushions and a reversible backrest. Its hardwood frame and sinuous spring system provides a classic balance of comfort and support. Since the 20th century, tufted upholstery has maintained popularity. Tufting is a technique, which although used for countless centuries, was a favorite among notable designers of modern furniture, from the Bauhaus period to present-day. From Le Corbusier and Van Der Rohe to Hans Wegner and Ducaroy, the times have proven that clean lines and accented tufting never goes out of style. While many of the distinguished works produced by such makers remain available today at a premium, the Flo Sofa provides an iconic look at an unparalleled value. SIMPLY THE BEST SOFA I'VE OWNED! I have a passion for all things mid-century modern. I passed on purchasing several SOFA before finding this one. It was a risk, buying sight unseen but I took it. It was the best choice I could have made. Perect delivery, easy to assemble. Plus great easy credit terms! Awesome! ProsEasy to assemble, perfect color as described, easy credit terms. glad to finally have one! I saw a similar sofa in a cafe when visiting california a few months back, I finally got my hands on this myself - retro and modern, versatile, great quality - I love it! Rounded pillows are such a nice touch to this design, I barely noticed them at first but they matched even better with some of the other furniture designs in my living room! I purchased this couch in light gray. We financed through the available Bread service. So far everything has been great. The driver called 20 minutes before he arrived so I was ready. They delivered to the front step. (I didn't want to pay extra for in house. My husband was supposed to come home to help me move it in but I was able to open the box and with only a little trouble move it in by myself. (i'm 5'7 150lbs) I attached the legs (all though 2 of the plastic screw caps on the legs gave me a little trouble, which is how i chipped my tooth). The couch is lovely it's as long as our old couch but slimmer and takes up way less room. While the seat looks deep enough it does seem a bit like it wants to push you out. It is not hard but is also far from soft. We've had it for two days but so far I have no complaints. I chose this couch because I like the look and it was relatively inexpensive. We have a lot of young children so I didn't want to buy something that I would be completely crazy about. $650 is not money I want to lose but $1500 would have been much more insanity inducing. ProsEasy to put together, easy to move. ConsSeating could be a touch more comfortable. PERFECTION!! Gray fabric matches beautifully AND the wood finish on the legs matches the wood on my other furniture and fixtures as well! I was amazed, i seriously had my doubts thinking it might be slightly off but not a chance - like they were made for one another! BEST SOFA I'VE EVER OWNED!! I had this sofa for about a week now but i wanted to wait a week or so before writing a review just to be sure I TRULY experienced it before speaking my mind and the results are in! I love it!! It is comfortable whether I am sitting, lounging or laying - it looks great and I haven't found any flaws even though i've been trying to find them haha! Absolutely great! Thank you a ton! This is a good addition to our household, I thought the bolster pillows were a nice touch to the design, it definitely has a simple and chic style to it without being boring. Helpful customer service as well, thanks! design matches very well with my decor,, item arrived quickly and customer service was excellent! I'm very pleased with this piece. The quality, size, and appearance are beyond expectation at this price point. It looks incredible in my space and is great for napping (so roomy). I think my out of town guests will much prefer this over my previous couch. plush yet firm, stylish, love the design and looks fabulous in my family room! Everyone at Inmod is a pleasure to speak to. They are all so helpful. I purchased this sofa in the dark grey color and it fit perfectly in my family room. It's great to have such an affordable modern piece in the house. Great look, nice detail tufting. Overall very satisfied. I was nervous to order a sofa online without being able to sit on it. But Staci in customer service reassured me that it is. I'm SO glad I bought this. It's structured but super comfy. Product is fantastic quality and staff was great to do business with. This sofa is very nice. The seat is firm yet comfortable. The backrest & arms of the sofa run on the lower side, as you would expect with this style. The delivery was excellent. The driver called when he was an hour away which was a relief. The set up was simple and straight forward. Please could you let me know where the Flo sofa is made, and what are the materials the cushion interiors are made of? Thank you. The Flo Sofa is manufactured in China, and the cushions are made with polyurethane foam. We do not use any flame retardants in the foam. Can you please give me the weight capacity of this sofa? Thank you. Each sitting area of this sofa is rated for up to 300 lbs. At one point we only made the Flo Sofa in a gray finish. Now we offer all 3 color options of Light Gray, Dark Gray, and Green, which are all available. To request swatches, you may email us at [email protected] with the colors you would like to see along with your mailing address, and we will send swatches to you right away! What are the shipping package dimensions for this product? And, What is the minimal doorway requirements? The box dimensions for this sofa is 86"x34"x18". The minimum doorway width would be 20". What is the interior seat width of this sofa? The interior seat width is approximately 74.5". The seat height for the Flo Sofa is 18 inches. Type of upholstery material. Wool, Rayon or what? The Flo Sofa is upholstered using a polyester fabric. What are the dimensions for each of the following? Arm height Leg height Seat height Thank you! The Flo sofa has a seat height of 18", arm height of 24" and the legs are 5.5". The Flo Sofa is currently only offered in the color shown which is a medium Grey. Is the cushion firm, medium or plush? Does it have a center leg brace (it seems to show in the picture)? The cushion on the Flo Sofa is medium firmness. This product does have a support leg in the middle back to help support the frame. What material is this sofa made of? Linen? Polyester etc? The Flo Sofa is upholstered using 100% polyester fabric. Does this sofa come in any other colors? The Flo Sofa currently only comes in the grey fabric as shown in the photo. Is there any assembly required for this sofa? The Flo Sofa requires minimal assembly. The legs are all that need to be attached and it will come with any necessary hardware/hex key. are the cushions on this sofa attached, or do the come off if needed? The back cushions for the Flo Sofa are loose cushions and the seat cushions are attached.